The soil covering the surface of our earth is essentially a three-phase mixture consisting of soil particles (solid), water (liquid) and air (gas). Even saturated soil saturated with water is a two-phase mixture consisting of soil particles (solid) and water (liquid). Polyphase mixtures which consist entirely of different substances are troublesome substitutes that are difficult for human beings to deal with, but because they are natural substances, they seem to be “dreamlike materials”. Focusing on the essential constitution of the above-mentioned soil, it notices the following. Unlike iron and concrete, soil can “grow”. In other words, it is possible to narrow the gap between soil particles (there is water and air there) and strengthen soil, so as to “grow up” the child to an adult. At this time, care must be taken not to destroy the soil with too much sudden large force (it is the same as not being able to carry heavy backpack for children). These things have long been well known as “compression” or “consolidation” phenomenon. Why did not human beings utilize such wonderful characteristics of soil more aggressively? It may be because many people imagine that “consolidation” is a troublesome phenomenon by which the ground subsidence does not stop. 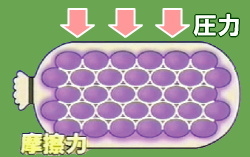 It has been analyzed that the ground can be “grown and strengthened” in a short time to become to have about three times the bearing capacity of the original ground by gradually loading on the ground so as to cause “local consolidation” of a certain loading width on it. 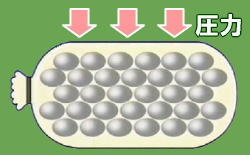 For example, it has also been analyzed that if loading is carried out step by step so as to narrow the loading width inside the “reinforcement strengthening” region and to make the “localized consolidation” further, the ground becomes to have 8 times or more the bearing capacity of the original ground in a short time. 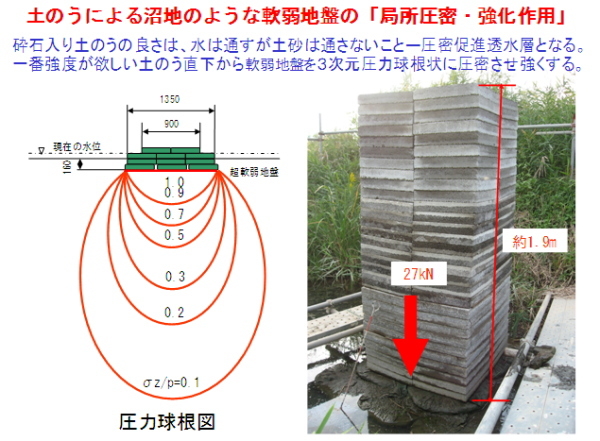 Although this kind of analytical calculation became possible, the soilbag construction method (D・BOX construction method) has already practiced this with soft ground such as rice field and swamp (Analytical calculations are behind field performance.). For example, we can “nurture” the soft ground of N value=1 on the ground with N value=3 or 4. From now on, it is unnecessary for the ground with N value = 1 to consider keeping N value = 1 in the future. 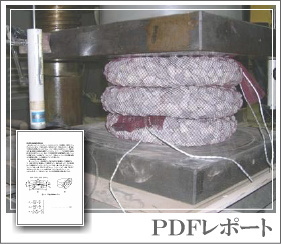 Next, let’s summarize the characteristics of soilbags (including D・BOX). 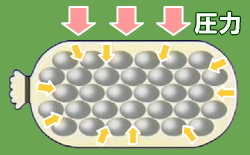 The most effective and ultimate reinforcement method against soil retained by friction between particles is “to completely envelop and restrain soil” (principle of compartmentalization of granules). 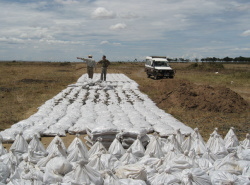 Soilbags are a typical example of their application. The mechanical mechanism that the soilbag itself exhibits astonishing proof strength is clarified, and the two-dimensional and three-dimensional formulas of the strength of the soilbag itself are derived. Just by wrapping restraint, you can reliably apply cohesion c even without putting adhesive (cement) (here is the essential reason for the strong soilbag). 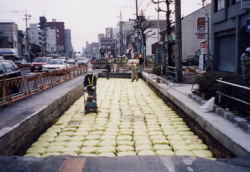 One soilbag can withstand a load of 20 to 40 tons (one or two vehicles of JR). In the soilbag with permeable materials such as crushed stones, the stitch of the bag acts like a filter, allowing water to pass well but not soil particles. Even if the soilbag is placed on a very soft clay ground in water, it absorbs water (water pressure) well, locally consolidates from just under the soilbag into a pressure bulb shape, and strengthens the very soft clay ground in a short time. 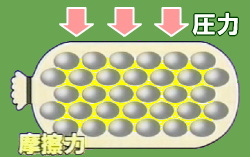 As a result, the bearing capacity of the ground is increased and the settlement amount is decreased (local consolidation / strengthening action by the soilbag). In addition, as the soilbag passes water well, drains the water pressure, and it does not pass soil particles, it also becomes a measure against liquefaction during earthquake. Since the soilbag has a slight suppleness, energy of the traffic vibration and the seismic motion is dissipated as friction heat energy between the particles of the filling soil and the soilbags, by a little expansion and contraction of the bag which is invisible to the eyes. 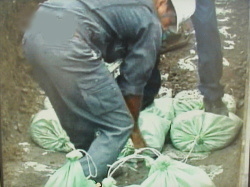 The soilbag with crushed stones has an effect of preventing freezing. 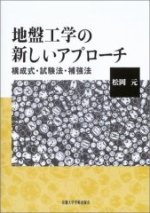 The fact that the crushed stone particles are large means that the gaps between the particles are also large, so that water does not rise in capillary. Therefore, do not freeze because there is no water supply. 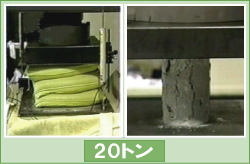 As mentioned above, the high cost performance of the soilbag construction method (D・BOX construction method) which brings out the effect of one method as five effects ―　soft ground　countermeasure, liquefaction countermeasure, earthquake countermeasure, traffic vibration countermeasure, and anti-freezing countermeasure deserves attention. 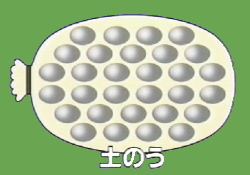 It is exactly the method of “One Stone Five Birds”. In addition, as a precaution, do not expose the bag of soilbag (D・BOX) to sunlight (ultraviolet rays) (although it contains UV inhibitor). 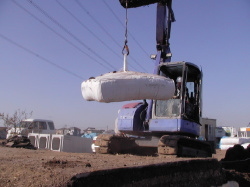 If buried in the soil, since the material of the bag is polyethylene　or polypropylene, it has semi-permanent. Looking at the field of Nobel’s physiology / medicine awards, I have heard such comments as follows: “It was found that medicines originally developed for livestock are also effective for human beings, and the achievement of helping many patients all over the world is extremely great.” Like the human body, the phenomenon of the ground which is a natural thing also has complicated strange aspects ― especially vibration problems and seismic motion problems. I think that it is not necessary to wait until the whole thing is elucidated. Even if we look at construction examples well above 2,000 so far, it has been proven that it is nearly 100% effective unless there is a clear mistake in construction. Since the principle is clarified and the achievement is already sufficient, I think that it is better to use it more and more and check the extent of its effect by inspection with suitable measuring instruments if necessary. 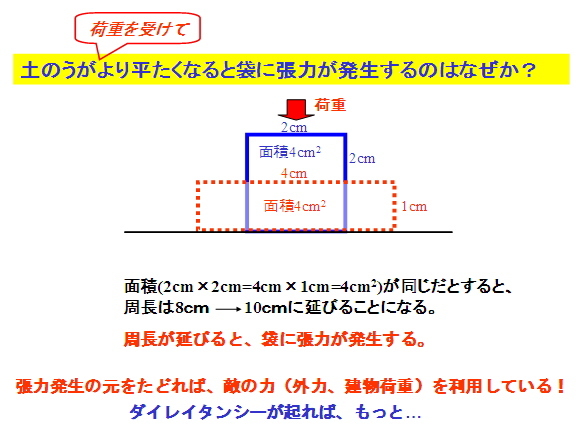 There seems to be some designers who do not adopt it unless analytical method or calculation method which can predict the result beforehand is adopted, but if the analysis method and the calculation method used in the world are perfect, the accident concerning ground should not happen. If this construction method, which only encloses soil with a water-permeable bag and restrains and tightens up, is a really good thing rooted in the essence of soil, we expect that the appropriate analysis method will be found in the future.